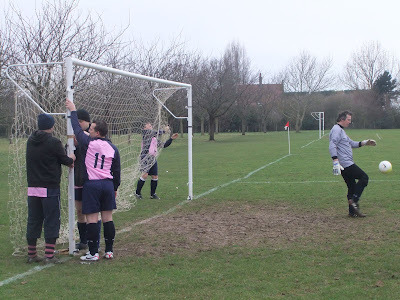 Worthing supporters' 6, Dulwich Hamlet Supporters' 4. Played at Goring by Sea. Report kindly supplied by Shaun Dooley. Clapham Junction, East Croydon...familiar stations for members of 'The Rabble' who follow The Hamlet on their jaunts down to the Sussex coast. Even more significant on Saturday 22nd January as we were up even earlier than usual to fulfil a Supporters' Team fixture away to our good friends from Worthing FC...'The Rebels' supporters' side. The fun had actually started the previous night for one of our number, when Phil 'Widow Twankey' Baker had gone out on the town for a few jars, having gone down there the day before to make a weekend of it. Well the 'Jack Horner' he found was nothing like the one in the nursery rhyme! Oh no, this was a pub,apparently, with a transvestite barperson, and a couple of ladies in their wheelchairs watches 'Les Miserables'! In some ways this was srely the perfect pub for Phil, as there was no queue for the bar! I believe he stayed there for wuite some time, the things he does for a drink eh? Back to the rest of us...after much joviality on the train down to the seaside, much at Phils expense, as Caveman Nick, the London based Rebel, filled us in on dear old 'Jackie Horner', we soon arrived at Goring by Sea. The place where we play our away fixtures against Worthing has a two storey house as the changing rooms & despite still being freezing cold, it had had a makeover since our last visit! (Which, somewhat shamefully, wasn't last season, as we couldn't raise a side). (Mishi writes) Pre-match I was going to take a team photo, but due to not all the squad for the day being there I was going to take one after the match, but a couple of players dashed straight off. I couldn't take any pics during the game as I was playing, & it is extremely diisappointing for me when I cannot get a team photo, as I like to collect them season by season for posterity, game by game, at the least the ones I can get to when not working. A little bit more awareness & help from the peeps that run the side would be appreciated, in future, especially after having asked for a team shot after the match, in advance!. End of moan! 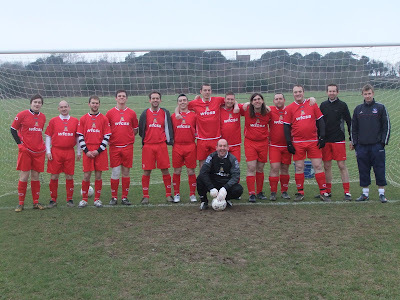 I did get a shot of the Worthing team, including one as they attempted to line up, perfect for a caption competition. 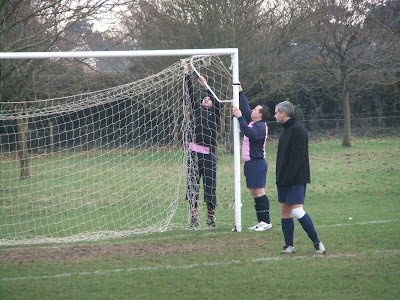 A thankless task, ignored by many, but an essential part of our friendly for fun football! Onto the game now itself, & due to the now expected late cry-offs we were down to twelve players. Included in this 'dirty dozen' were Nicky Quilter & Jamie Wyatt, making a welcome return to our fold, having been regulars in the early to mid nineties! Whos' this playing 'peek-a-boo!' with his old childhood shirt? None other than one of the 'prodigal sons' Jamie! After kick off we had a bright opening spell,& were holding our own up until Worthing's opening goal, when onr of their forwards found himself in space after a lucky break, & shot low to Paul Griffin's right in goal. 'Griff the Cat' got his hand to it but couldn't keep it out. Worthing hit a second not long after, & then forced a succession of corners, from which our stout defending managed to keep at bay. At the other end, 'Gaffer' Mick O'Shaughnessy put himself up front, with his son James not available. 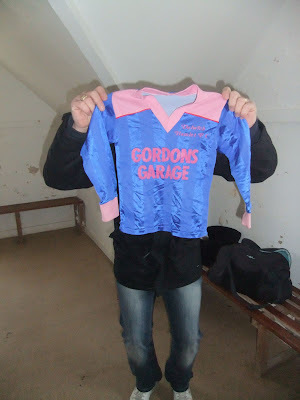 despite his advancing years, and more portly figure in comparison to his boy he was looking almost as lively, & after about half an hour scored probably the finest O'Shaughnessy goal ever scored in the Pink 'n' Blue, betting the previous efforts over the years from both of his his boys James & David! He was released down the right hand channel, & took the ball into the eighteen yard box& was almost on the touchline, and chipped his precision shot over the Worthing custodian into the top left hand corner, reminiscent of Chris Dickson's goal at AFC Wimbledon in a 2006 London Senior Cup tie! Buoyed on by this we got ourselves forward more and were proving to be more of a danger, until a long searching ball forward was misjudged by our defence & headed backwards, which was them picked up by one of our hosts, who rounded our keeper & slotted home. Another was added before half time, and in the process Griff was injured attempting to thwart it, though-thankfully- it did not impair his ability to pick up & down his pints later! In a positional manoevre that was reminiscent of the pre-war era when there was no substitutes, he bravely came back outfield, in a move that Tommy jover would certainly have looked down from up above, & smiled on approvingly! The start of the second period saw us get a bit more into the game, possibly because we were attacking the slope! But alas it was Worthing who scored next to make it 4-1. But our 'never say die' attitude always gave us hope & we got back into the game, when one of our attacking moves saw Larry Marsh square unselfishly to the returning Nicky Quilter about ten years out and he smacked his shot into the bottom corner to reduce the arrears to four two. "Just read the supporters report of Worthing. I'm very disappointed. My goal was a wonder goal taking the ball forward after a one-two with Larry, looked up and spotted the keeper off his line from 25 yards chips with aplomb!" But Worthing went on to restore their three goal margin when a deep cross found the bonce of an unmarked Worthing forward, to head home. But rather than fade away we kept our challenge, and Larry Marsh chased down a backpass, which the Worthing keeper kicked straight at him. 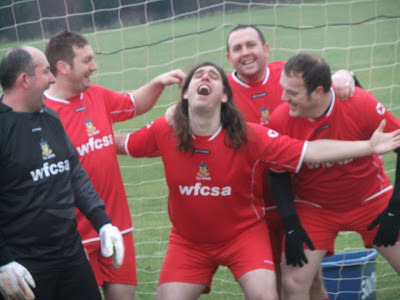 He then cooly went round the keeper & slotted into the empty net. By now it really was 'end to end', the play really open, with tiring legs on the heavy pitch. worthing scored their sixth when a move down the left found one of their midfielders 25 yards out & he hit a fine shot over our keeper into the roof of the net. 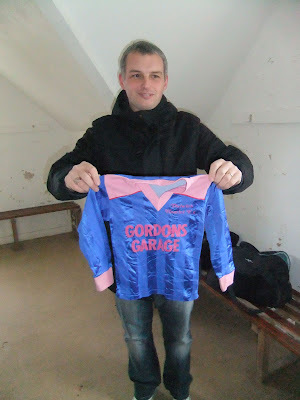 Then came another final goal for us, from the 'walking wounded' that was Paul Griffin! A low Steve Rickerby corner deceived two Worthing defenders, & hit their keeper on the shin, with the 'Cornish Poacher' (even though he's actually from Wiltshire!) to whip the ball home from four yards! That was the last of our goals, but there was still time for a superb Steve Rickerby free-kick from 30 yards, at least, which smashed against the underside of the crossbar! It's always a pelasure to play the bunch of fans tha are the 'Rebels' from the south coast, long may these fixtures continue!